So I didn’t publish more than – what? – THREE blog posts in the second half of 2014. One of those was a guest post, so it doesn’t count. And another one was a podcast announcement, so it doesn’t really count, either. Which leaves me with a grand total of one (in numbers: 1) posts written and published in the second half of 2014. Good that nobody’s paying me to write here. I have thought about this some more while not blogging. I don’t know about you, but I actually do get talker’s block occasionally. Normally, I tend to be actively engaged in any discussion whatsoever. I chime in, I argue, I defend my point of view. But when I don’t have a clue, I prefer to remain silent. When I meet someone really wise, and she’s willing to talk, I’m a happy listener. And if I’m not, I’d better be. Even when I’m just joking around with friends, there are times when I simply shut up and take a deep breath. To enjoy. Enjoy the moment. Enjoy being alive, and being in good company. Enjoy experiencing what’s around me. Not a bad thing to do. Occasionally. This is directly related to number 1. As mentioned in one of our podcasts last year, I had quite a nice time doing things in 2014. Instead of writing about them. I traveled to Lisbon, the Atacama desert, the Amazon, and through much of Colombia and Germany. I helped a friend to open a kitesurfing and SUP school on the island. I worked more for money on the computer and for free elsewhere. I also earned more. I designed my first photo book (and got it printed). I gutted a house, enjoying some of the most physically challenging work I ever did. I spent a decent amount of time with friends and books and family. And taking walks. Long walks. Good things to do. I know that quite a few bloggers use their blogs to hold themselves accountable when it comes to doing interesting things. Chris would call these things „quests“ and has created a bit of an outline of how to follow through. Which is a smart and fun thing to do. We can simply do stuff, too. Without much planning. Without anybody knowing. Without a big picture. Without an official announcement. You lose some helpful public pressure on the way, sure. It’ll be a bit more chaotic. But you save a whole lot of time to engage in interesting things. Or to sleep in. Whatever you prefer. And that leads me to my next lesson. Which shouldn’t be in this post because I’ve not yet reached a conclusion. Oh well. I spent some time pondering the relationship between planning, experiencing, reviewing, and reporting: You think about stuff, you do it, you digest it, and then (maybe) you write about it. In 2014 I wrote the least in… probably 15 years or so? I also took relatively few photos, at least in “daily life”. I didn’t follow any grand strategy, even though I played with the idea. And it turned out nicely, because – as I said above – I managed to do so many things. And to sleep in. Sweet! But I also noticed how the year slipped a bit through my fingers. The digesting part – thinking and feeling – still happens, but it happens less than when I write about things. Same thing for planning. Which probably means getting back into writing mode, in one way or the other. A living room shouldn’t be owned by a government or corporation. It should look like you like it, even though others might despise your wallpaper. And while you may have an open-door policy, ultimately it’s for you to decide who gets to sit on your couch and who has to leave. This also matters when we look at reporting. In my living room, I might enjoy to undertake profound philosophical discussions. Or I might laugh about a fart joke. It’s my personal decision, just as it is your personal decision whether you want to read it. Not blogging did a lot of bad stuff to my writing.2 It also changed my reading behavior. Full disclosure: I never read many „pro bloggers“. But by now, I’m almost exclusively reading personal (in the sense of: 1-person) blogs, and the larger part of those are published by folks who don’t earn a living with them. A few of them do, at least in part, but they do it in a low-profile, non-pushy, tasteful manner. No sales pitches that make me want to grind my teeth out. One thing I’m glad to miss out on. JOMO! JOMO, n. The pleasure derived from no longer worrying about missing out on what other people are doing or saying. It’s derived from the phrase „joy of missing out“. People tend to use it in the context of having a „social detox“, but I’d like to extend the usage to books, articles, and online chatter. When I was still blogging regularly, my RSS reader was sacred. Spending hours to review the writings of my peers seemed of crucial importance. Productivity nerdism became another (related) timesuck. These days, it’s different. While I still enjoy my online reading, I also enjoy missing out on the latest hypes, deals, trends and „limited time offers“ that became part of many mainstream blogs. This isn’t limited to the writers. It definitely extends to the readers. Even after I hadn’t written anything for months, I still got regular emails from new readers who had stumbled on The Friendly Anarchist while browsing the web, and enjoyed a post from the archives. I also stayed in touch with a few fellow bloggers and long-time readers I really like. This has been delightful, to say the least. Now to a couple of less delightful lessons. Ever since Edward ███████, I don’t feel free ███████ ██ ███ ██████ █████ and also in ████ ████. The ███ ██ ███-███████ ██, █████ ██ happily keep watching Netflix. For me, this █████ ████████ █████ ██ █ self-censorship that makes me want to ████. ██ ███ and █ really ████ ███████ in our █████, we should keep asking ourselves whether we really want to live under these conditions. The writing muscle is indeed that, and it will degenerate. Why deny it? I like blogging. I missed it. When it doesn’t feel like a chore, it’s marvelous. Austin Kleon would say: Keep your day job. I’d say: Escape your day job. But I still agree that blogging, as a job, seems like a pretty meh choice by now. I’d like to see blogging more as a work in progress once again. Long posts like this one can easily take 6-8 hours to write and edit. While I believe it is worth it, I also began to enjoy a more fluid and minimal writing style among many bloggers recently. Expect some more of that. People asked me to tell more about my post images. 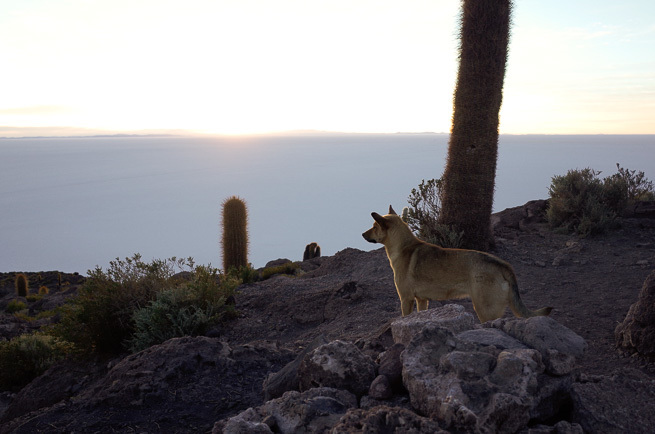 So here we go: The photo shows a dog contemplating the sunrise on an island in the Salar de Uyuni. He went up to the hill with us, seemingly not caring about the people, but about the moment. The zenest dog I’ve ever seen. And definitely one of the most impressive places on Earth I ever had the priviledge to visit. ad 1) I can second that. We have only met once, but I do remember you as an very pleasant listener. And that one of the most appealing characteristics one can have, especially when meeting a talky person like me. So: Totally right, totally perfect. Keep it. This is not writers block, it’s a virtue. ad 2) As much, as I enjoy my blog and the fact, that it is a vital part of my life … the most satisfying things are doing stuff. Building a 5 meter long Rack in the basement for storing stuff. Rearranging Rooms. Private Programming and professional Programming, which means, getting Work done at Work. My Blog is not there to compete with these things. It’s on a different level. It’s habbit, like brushing teeth in the morning or taking a shower. Or maybe like a meditation, or daily sun slutations (if I were doing them daily, like I used to). Maybe you want to add a moblog feature to you blog. I mean … all the places you have been, all the amazing things you have done last year … there must be at least a few more nice Photographs than this great dog in the desert! Please, show us, if you don’t mind sharing! I would love to see them. ad 4 and 5) Yes, yes, double yes! ad 6) Oh, I event haven’t heard of that. Nice Idea, and so perfectly true. Thanks for sharing! ad 7) Yeah! I’m regullary amazed how … emergent … blogging and bloggers are. The People that are attracted to my Blog and the People of the Blogs I stumble into … they are almost always great people to know, to spend time with and to enjoy oneanother. Personal Blogs really, really are some kind of magic guiding network. Someone should do a PhD on that, some day. ad 10) Haha, you’re funny. To get back to my first Statement on this: Why didn’t you made 11 Post from this one? I know, I know … I also do stuff like this quite often. Sometimes you just want to have everything you have to say in one Post. On the Dayjob thing: Yeah, by now I would totally agree to you. Although the thought of being payed for blogging all day, is very tempting; and although I regularily catch myself by thinking about how I could get money from blogging; although it’s kinda nice idea, it’s against everything that I love about blogging. Blogging is best, when it’s wildly romantic, humanistic, deeply personal, erratic and unambitious daily adventure, that doesn’t want anything, but to connect people with themselves as well as with others. There’s no way you’ll ever get paid for stuff like that, because it’ll ruin everything it stands for. In that Spirit: I love this blogpost and was very happy to read stuff from you again, after such a long while. The things you write are precious. ben_, while you’re statement about the 11 posts is quite right, your comment also could stand like a couple of posts on its own! Glad to hear from you, as your blogging style definitely is a big inspiration for me. The personality behind it and the smoothly flowing development of it all is exactly what I love to see in blogs these days. Awww … Fabian, thanks a lot for the Flowers. I can give a bouquet right back to you. The way you see things and hold your life in your own hands is not only inspiring, but also a source of happiness to me. The friendly anarchist is the Shangri-La of Blogs, and I am happy to found the way here. Hi, Fabian. Firstly the headline didn’t offend. In fact, I found it quite refreshing not to stumble across another “…with one effin big leap Jack or Jill conquered the whole bloody hill.” I too have had something to say about blogging, and like you struggled a bit in 2014 to find a cadence that wasn’t either fully on, i.e. every day, or zip. Right now though, not to sound like I’m in Seth mode, I’ve been blogging daily to Livejournal since 14 December and intend only to post once a month to my main site. If you ask me why, I don’t know really but truth be told I feel if I don’t get my stuff out there then it’s not others that are missing out (if that doesn’t sound too egotistical) but instead my little old muse that wants me to create something every day no matter what. Notwithstanding all this, I recognise the importance of a reprieve from the self-induced pressure to blog, and this time round, if it happens, I won’t feel so damn guilty knowing that even though I may not have a slew of words to my online name, at least I’ll have done other, often more important, stuff. What’s your plans for 2015? Hey Julian, good to hear about your LiveJournal experiment. Hope you’ll keep at it, whether daily or not, just at the right pace (“tempo giusto”, once again)! As for 2015 plans, there are a few smaller adventures lined up. The rest is going to take its form spontaneously, as it always has. I’d like to get more into photograohy once again, but I don’t even own a camera at the moment. But that too is going to happen. As for “life skills”, I strongly believe that we get these mostly as a by-effect. But one thing I have been improving in recent months has been my (un)productivity. This is not to say this is going to be automatized anytime, so I’d like to keep being conscious when it comes to that. You’re definitely not MO as far as Ello is concerned! Great post, good to have you back in the blogging warrior arena, and I totally agree that the absence of a sales pitch is like a breath of fresh air these days. This posts reminds me that I should go back and read Blog Beyond Rules. I quietly quit my blog a few weeks ago now. The end was frantic. I emailed close friends my detailed pros/cons lists and felt I needed their permission to quit. Every day, I would wake up, and there it was. On my to do list, there would be 1-2 maintenance tasks for the blog, apart from also forcing myself to produce one new post a week. I also began to read more blogs than ever before. I felt obligated to show up for my readers and put myself out as bigger than I actually am. I had job offers come from the blog, as well, and I kept pushing myself along talking about how blogging is the new resume, etc.. In the end, I did end up quitting (an archive of my favorite posts and the technical ability to publish are still there, just in case), and it’s now been a few weeks. I haven’t done much since blogging took up so much of my time, but I feel like it’s okay to say “I don’t know,” again, and I’ve successfully been able to begin roadmapping a new direction I’ve been excited about but unable to define and pursue. Too many people say you should blog. It’s been very freeing to look back and remember all the stuff I’ve done over the past year that I haven’t spoken much about. I think there’s more value to it. I think comments on your old posts close, so here are thoughts after reading BBR. But, there is a process-based podcast idea I’m pretty interested in. I’m going to go ahead and try it out in private for a month or two, and then we’ll see if I do it in public. The hard part is avoiding looking up “How to Succeed at Podcasting!” and to be content to podcast beyond rules. Radhika, sorry to hear about the unfortunate end of your blog. Knowing you just a little, I strongly believe you’ll find a way to make your publishing platform really *yours* again, though. As for podcasting, Milo knows a lot more about that than I do, but I feel we’ve been podcasting beyond rules with MoSho ever since the first episode. If you’re not after a quick success, that’s certainly a route to take. Whatever happens, don’t let it stress you out. I’m quite sure it wouldn’t be worth it! Hi Fabian, thanks for sharing your thoughts. I recently read Scott Berkuns book about his time at WordPress.com. It is a recommendable book at it reminded me on our chats about working locations and virtual jobs.